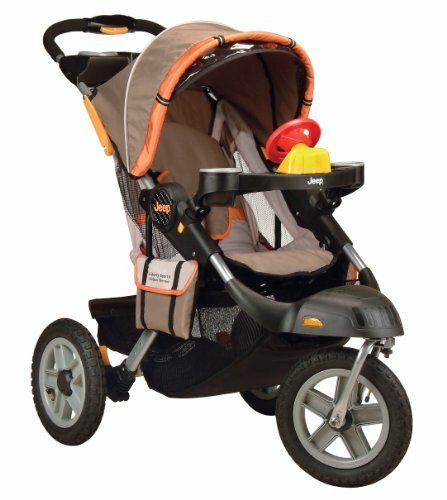 This is the summary of consumer reviews for Jeep Overland Limited Jogging Stroller with Front Fixed Wheel, Fierce Orange. The BoolPool rating for this product is Good, with 3.90 stars, and the price range is $150-$210. 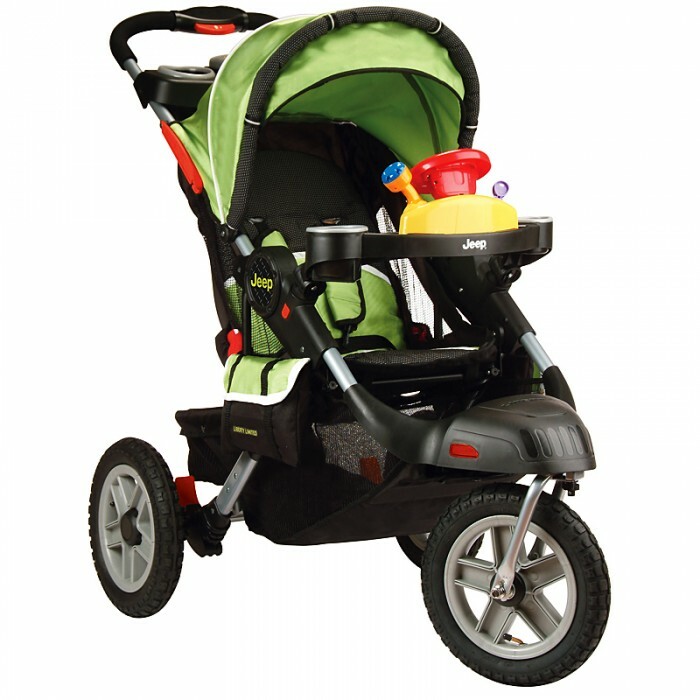 Jeep Overland Limited Jogging Stroller has a fixed front wheel for better handling when jogging. 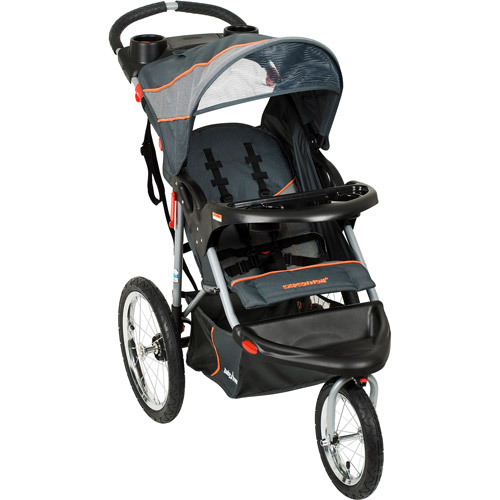 The 16 inch air filled tires provide a comfortable smooth ride for mommy or daddy and baby. This stroller has an adjustable handle with good grip which adjusts to multiple heights and different angles. It is sturdy and has a lightweight frame. This Jeep jogging stroller has a child tray for snacks and a cup holder. Parents also have all of their jogging essentials within reach: dual cup holder, music, speed and distance odometer. This Jeep stroller conveniently stands upright when folded and it can be rolled easily too. Parents like the big storage basket, an adjustable sunshade and a comfortable multi-position reclining seat with 5 point safety harness. It also has hand brakes, safety tether & reflectors for additional safety. It boasts the iBaby Sound System where a portable audio electronics, like an iPod can be plugged in to enjoy music on the go. Some parents do not like the iBaby system as the sound quality is not good and the speaker is right behind the baby's ear. Also, pedometer does not work very well. Many users experienced that tires go flat very fast on this stroller. 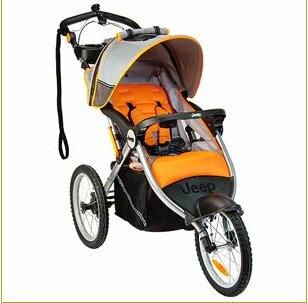 Overall, Jeep Overland Limited Jogging Stroller with fixed front wheel is a sturdy, lightweight and comfortable jogging stroller. It is easy to push and turn. Users just need to learn to turn because it has fixed front wheel. The handle has to be pushed a little and turn has to be wide for proper handling while turning. It's easy to turn with the fixed front wheel, just pop a little wheelie and turn. it was hard to turn and handle. I've jogged with it twice so far (roughly 3 miles each time), and turning was really easy. It's hard to turn the stroller, because the front wheel is fixed. The fixed front wheel makes it VERY hard to turn. You literally have to pick up the front end to turn even the slightest turn. My daughter (2yo) loves it and so do I but was surprised when the front wheel didn't turn so the stroller has to be tilted to turn every corner!! Light and easy to turn when necessary, locked wheel great for jogging. When making sharper turns, you can even turn them without lifting the front wheel, just have to be firm pushing one way or the other. I'm a big jeep product fan as they make great products on the whole. Other than this issue, it's a nice product. For the city though, I think it's very good product. Wish they'd more color choices.Great quality product. 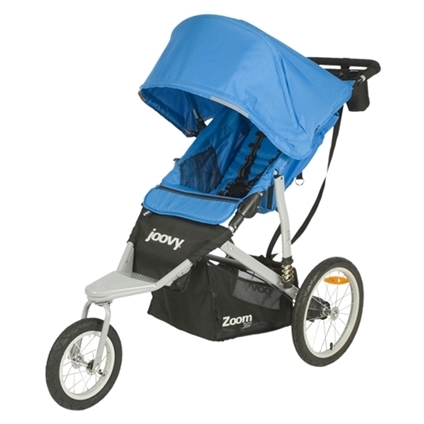 It's very comfi and we all use it to take the baby out doors.Great product. I'm glad to say that I really love this product. This's a very nice stroller otherwise. Little one is comfy and we're crusin! I ended up returning it and getting the one with the pivoting front wheel. My son loves riding in it. My son loves it to. I walk 5 miles a day with my son and he loves riding in it! We love taking family jogs with our son. Love it and so does my son..
Easy to handle, works perfectly and our son is very happy riding in it. I do wish the front tire had the option to swivel but overall, our 15 month old son loves it. I love that the canopy can unzip and be angled forward to protect my son from the sun or wind.The stroller pushes easily. 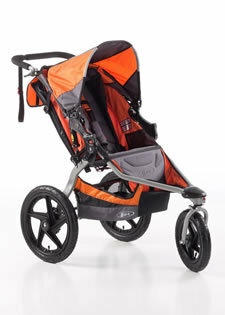 i love jogging with this stroller it's sturdy and my son fell asleep in it while i was jogging!! It works, but the speaker is right behind the baby's head. at first i thought the wire aong the side was for speakers to the baby music stand, but it ends in a wheel sensor, and the music comes from a single external speaker by the babys head. The pedometer doesn't work, the speaker sounds better on my iPhone anyway and my kids sippy cup doesn't fit in his cup holder. The speakers work well as does the odometer. 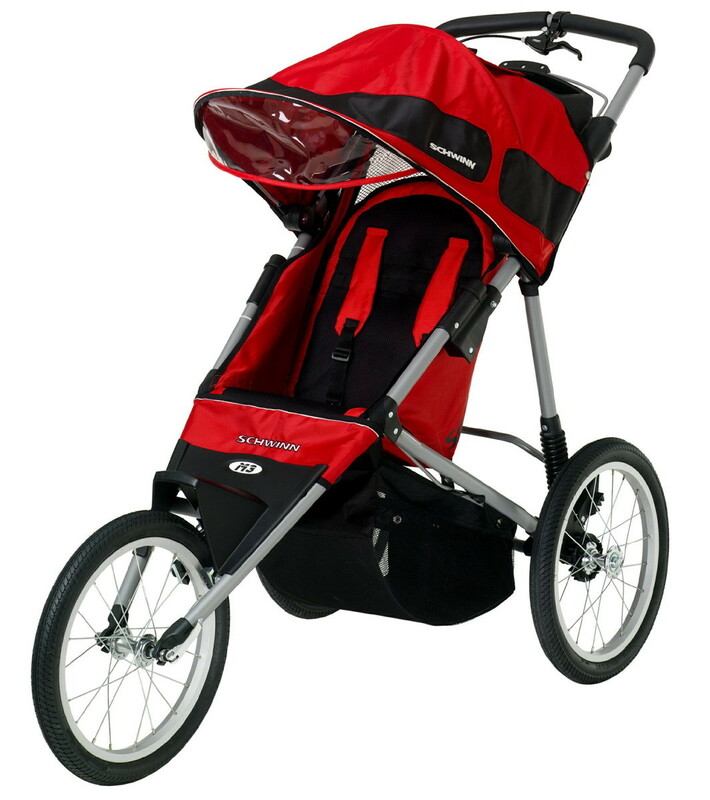 I like the lightweight frame, larger wheel size, adjustable handle and smooth ride for my baby. 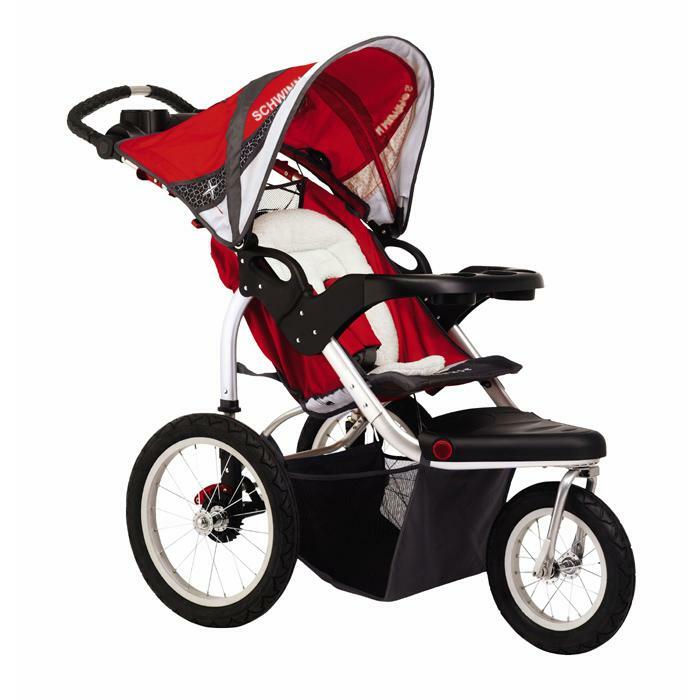 Really good pram for jogging and walking and comfortable for baby. The ride seems to be ok for my baby. The music thing is terrible on this...makes a buzzing sound and the speaker points at the baby not at the operator...weird! I'd have preferred one that gave you an option of having the speaker face the baby, parent, or both. The wheels don't seem very stable, and the sound system is useless as my iPhone is louder than the speaker. The only downside to it was the pedometer doesn't work well. The ibaby feature doesn't work that great with an iPhone which is a negative and the pedometer doesn't work at all. I've read other reviews that say that the pedometer feature doesnt work, though I'd no trouble getting mine to work perfectly. That part works well, but it's not very loud. I love the snack/drink tray for my 20 month old and the speakers work great with my ipod. The speakers work but the compartment doesn't fit my iPhone. It's really sturdy, looks very nice too. My daughter really loves this stroller. 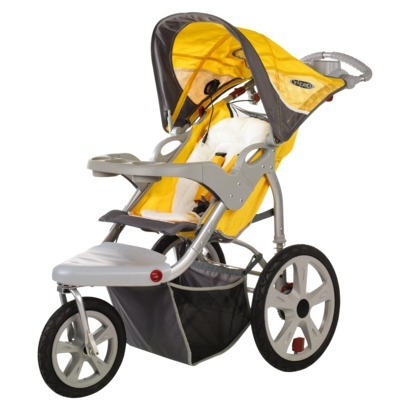 There's plenty of storage and the movable sunshade makes it easy to keep baby comfortable & cool.Overall, the stroller has really exceeded our expectations so far. It handles well and it's lightweight even though it looks really big. I really recommend this stroller. I didn't really care too much about the music but the features that are really good include:. The handle bar easily adjusts for both my husband and I. The one feature I really wanted we're breaks because we've a lot of hills around us and the front wheel worked great. Since it's a fixed wheel it's really hard to turn but i was ready for that--you just have to make really wide turns and push down on the handle bars. Tires go flat ALL the time-. The back left tire became flat after being used maybe five times. The tires go flat and have to be pumped full of air as few times a year. Loved the tires on this stroller - just like bicycle tires!!! Maybe a no flat tire!. Awesome buggy but the tires go flat fast. I wish I'd've spent more money the first time around and invested in a better stroller!. It took us little time to learn steering the jogger. This's a smooth riding easy pushing stroller. He doesn't fall asleep very easy and he falls asleep in the stroller every time!!. LOVE, LOVE, Love this stroller. He loves that we can sing along to music & my daughter loves that she can walk beside us & listen as well. I love the adjustable handle on it as well as the adjustable seat for my daughter. Very easy to put together, folds nicely, and I love the easily removable wheels. He absolutely loves the Jeep and our daughter does too. I love everything about this jogger! Love the music feature along with the mileage counter. I love that the handle is adjustable since my husband is 6in taller than me, we can adjust it accordingly for our comfort.